A hot, overwound humbucker pickup that sounds neither muddy or shrill - The custom Alnico 8 magnet helps to give the pickup great mids while the high end is smoother than the harshness often associated with ceramics. A pickup with great warmth. Great clarity & definition for a higher output humbucker. Avaialble in a selection of covers or open coil bobbins. 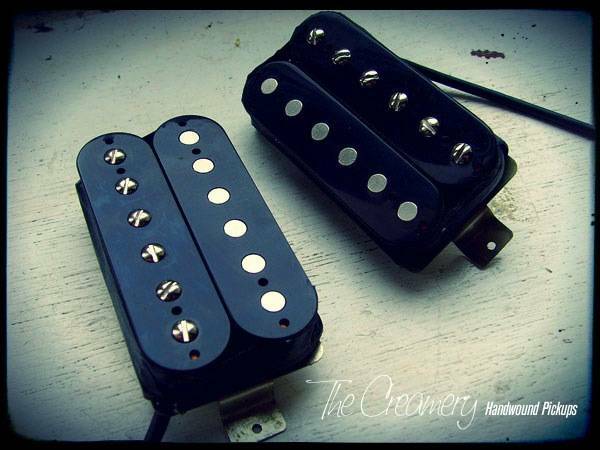 You can find more details of my Creamery Custom Shop Handwound Replacement Humbucker Pickups here.